Jean Plaidy's Royal Intrigue: We're Back! Happy Birthday Jean Plaidy!! We're Back! Happy Birthday Jean Plaidy!! What is it about Jean Plaidy that has millions of readers so fascinated by her writing? Obvioiusly her prolific style and impeccable historical accuracy are major reasons why so many people love her books- BUT, there’s something more than just that...if you’re hooked on Plaidy like we are here at Plaidy’s Royal Intrigue, you’ll get what I mean...don’t you find that her characters literally come to life...almost like spirits telling their own story? I always get that feeling. It’s almost as though the characters had some private meeting with her where they shared a real heart-to-heart and then Plaidy got privy to writing all about it. Another thing that always seems to amaze me, is that (in my experience) I’ve yet to read a book of hers that I didn’t get totally sucked into-Yes- her books capture my entire attention and set me off to the very time and place-always! It’s all so mysterious. And while we’re on the topic of mysterious; what about the Plaidy Lady herself...I believe she’s the most mysterious yet! I wish I could come across some bit of biography or tip on how she lived her life- something (besides the only source we have on her so far- read it here) that would shed some light on how she went about her writing and life. So, Arleigh and I thought how nice if we could honor her Birthday with an improvisation interview (a mock interview if you like;)- Just to get a feeling of what a conversation with her might sound like. Let us know if you thimk she waould have said it diffefrently! Join in the fun! 1. Is there a particular period that fascinates you most? Which one and why? I think it's apparent that I prefer writing based on my own country's history, though I cannot claim a particular favorite era. I enjoy giving voice to the misunderstood and there are very many among the British royalty and nobility who fit into that category. 2. Of all the novels you’ve written, which is your favoirite- why? I quite enjoyed exonerating both Anne Boleyn and Catherine Howard in Murder Most Royal, before writing their own individual stories in The Lady in the Tower and The Rose Without a Thorn. Henry VIII was a most interesting character to develop owing to his need to quell his conscious yet follow his desires. The careful reader will pick up on my disdain for the man, though I feel I did him justice. 3. Favourite character? Favourite royal? I heartily enjoyed writing the witticisms and jolly nature of Charles II in my trilogy: The Wandering Prince, A Health Unto His Majesty and Here Lies Our Sovereign Lord. You can also find quips from him in related novels on his wife, brother and nieces. Charles is my favorite royal for his humor, courage and loyalty. He charmed the people, walked among them and helped extinguish the Great Fire with his own hands. He did not discard his wife, though she was barren and Catholic. Oh yes, he was unfaithful, but respectfully so and never did he dishonor her as Queen. He may have been lackadaisical in the political and religious arenas, but we see with his brother, James, how being otherwise cost the throne. 4. Is there any historical figure that you have not written about that you wish you had? Many, but a writer has to tell the stories that demand to be told. Fifty years of writing is a wonderful gift and I have done with my time as well as I could. I'm sure my readers would have appreciated more novels set on the Continent, but it cannot be denied that the British monarchy is full of tales enough to busy any writer. I did, however, venture from England under my nom de plume Victoria Holt; places such as Italy, Southern France, Australia and the Orient. 5. We know that you typed away diligently at your typewriter on a daily basis. What was your source of inspiration? a particular muse perhaps? And what special advice can you give aspiring historical fiction writers? I love to travel and discover new places, which leads to fantastical story lines and wonderful characters. I've spent my later years on cruise ships exploring the world, and it's all the muse one needs! As for advice: read as much as you can. Reading is experience. Had I not had so much free time in my youth I do not know if my love of history would have been established. I am not overly fond of animals, except perhaps the exotic birds I have encountered on my travels. Sadly my solitary lifestyle does not afford me the opportunity to confide in any one special person, but I have many friends with whom I correspond regularly. My favourite colour is Royal Blue. And we end this BIRTHDAY CELEBRATION with a gift to you Plaidy lovers! 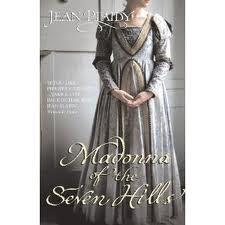 One brand new Arrow reprint (UK version) of Madonna of the Seven Hills to a lucky winner! This giveaway is open worldwide and ends September 13th. "In a castle in the mountains outside Rome, Lucrezia Borgia is born into history's most notorious family. Her father, who is to become Pope Alexander VI, receives his first daughter warmly, and her brothers, Cesare and Giovanni, are devoted to her. But on the corrupt and violent streets of the capital the Borgia family is feared, and Lucrezia's father causes scandal, living up to his reputation of 'most carnal man of his age'. As Lucrezia matures into a beautiful young woman, her brothers are ever more protective and become fierce rivals for her attention. Amid glorious celebrations their father becomes Pope, and shortly after Lucrezia is married - but as Borgias the lives of the Pope's children are destined to be marred by scandal and tragedy, and it's a fate that Lucrezia cannot hope to escape." For those who may be wondering just where in the heck Lucy & Arleigh have been... well, it's been a very busy summer! We plan to be more active so look for new reviews and posts soon! The Jean Plaidy Challenge is still open and the pages will be updated shortly. Thank you all for visiting! 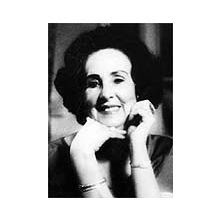 Right on happy birthday Jean Plaidy, I wish I could just glimpse how she just understood so many different people. She has earned the prolific title. My favorite period of hers Restoration England I would have to say. Add me to the entry pool I would love this one. I didn't realize how little is known about her, or how many different pen names she used. She died on my 46th birthday and certainly lived a long and productive writing life. Why is so little known about her, I wonder? Happy Birthday Jean Plaidy. I knew a couple of her pen names but not all of them. My library has a lot of her books, but not this one. I would love to win. I have been collecting her books albeit slowly and love her books. I dont have this one though and would love to be counted in. Thanks for making it international. I've read a lot of historical fiction novels, and have always heard of Lucrezia Borgia, but I've never read a book about her. I'd love to win this novel. Thanks for the giveaway. I haven't read a Jean Plaidy book for a very long time and would likle to get started on re-reading her again. Thanks for opening the giveaway to worldwide entries and please include me. Fun birthday post for Jean ;) This book sounds lovely and just in time before the HBO or Showtime? series this is being made about this notorious family. Ah to go back to Italy, even if it is through a book would be lovely with fall fast approaching. Thanks Ladies! That is awesome. Now that you mention it, I would love to read her biography. I love the mock interview, perfect! Thanks for the giveaway ladies! Happy Birthday Miss Plaidy and thank you for your Wonderful Books. Please enter me in this contest for this book. I've always wanted to read this book, and I wish we had more information about Ms. Plaidy. Sadly, I guess our imaginations will just have to fill in the blanks. I would love to read Plaidy's collected letters -- what an amazing correspondent she must have been! Thank you for the interview -- it made me smile and inspires me, as these things usually do, to work on a daily writing routine. I have yet to read a Jean Plaidy book, though I have no idea why she has eluded me all these years. I would love to be entered in your giveaway (jagreensmith at yahoo.com). Fun interview--I think for my first Plaidy, I'll start with "her" favorite, Murder Most Royal. I had no idea she was Victoria Holt as well. I loved the mock interview very interesting. I don't own any of Jean Plaidy books I'd love to have a chance to read it. I am so glad to see this blog active again. 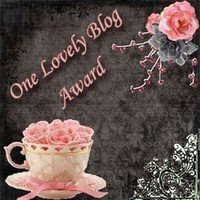 Jean Plaidy is my favorite author and this is one of my favorite blogs. Happy Birthday, Ms. Plaidy! This interview is so well written. It's almost like she was really answering the questions herself. And welcome back, Royal Intrigue! Haven't read much about Lucrezia so this would be great. Please enter me! I have read a couple of Ms. Plaidy's books but the titles escape my addled brain. A wonderful mock interview! You guys are so knowledgeable about all things Plaidy that I bet your answers were pretty close to what she would have said! I would love to be entered for this book please. I have a couple of Ms. Plaidy's books, but I don't have this one yet. It sounds like a great read. Please enter me in the giveaway. Thank you. My mother and I recently discover Victoria Holt's books translated in french. We read every one! and loved them. Great author!